The perpetually underrated but nonetheless vibrant Western Maryland river town neighboring West Virginia and Pennsylvania is easy to miss if you blink. Sequestered in the bowls of the scenic Appalachian Mountains in the westernmost point of Washington County, the Town of Hancock’s public and personal business would not be newsworthy outside of the town itself. Town elections, especially in small-town America, like Hancock – 2.75 square miles, to be exact, and less than 2000 residents – come and go without fanfare or news coverage. But Hancock is slightly different. Every small town is likely to have at least one squirrelly town scourge who revels in the role and lives up to the legends of their perceived reputations. In Hancock, Nigel Dardar plays the part to a tee. Elected a decade ago to the town’s council, Dardar’s repertoire of greatest hits include conspiratorial email rants fired off to town and state officials, a demand of federal oversight into town elections, comparing townsfolk to inbred villans from the 1972 hit cult classic “Deliverance,” filing a handwritten, all-caps state ethics complaint aimed at the former mayor and current town manager, and trespassing at Hancock’s new medical marijuana dispensary in 2017. This list above is not comprehensive. 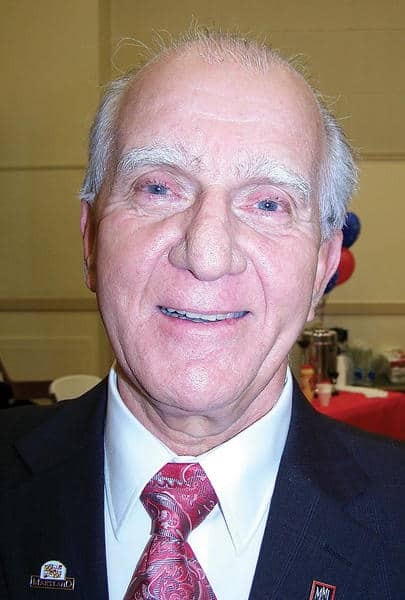 Now it’s round two for Dardar: The former councilman is mounting another challenge against incumbent Mayor Ralph Salvagno in the Jan. 28 town election. In 2017, Dardar lost the mayor’s race to Salvagno: 269 to 54. Dardar’s campaign is not so much a door-to-door effort or a classic get-out-the-vote strategy; instead, the former councilman purchases grandiose pronouncements in town’s local newspaper. He kicks off his contract noting that he writes the article “with various facts know and unknown” and goes on to reiterate town manager Dave Smith’s Jan. 9 resignation letter, highlighting that Smith’s letter did not explicitly set a date for his official departure from his town job. Dardar’s contract with Hancock descends into a declaration of grievances against Smith. 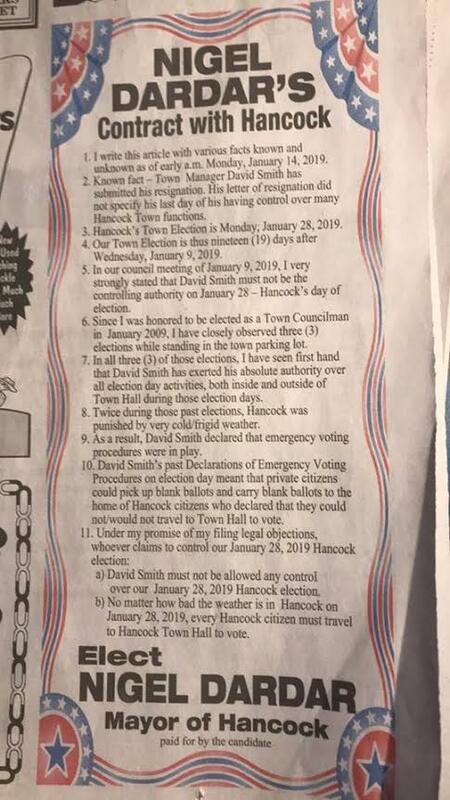 Dardar exclaims that Smith “must not be allowed any control over our January 28, 2019 Hancock election,” advocating that absentee ballots must not be accepted in Monday’s election. A Miner Detail on Wednesday spoke to Town of Hancock employee Jodi Finney for clarification on the town’s election policies and procedures. “Town residents had to request absentee ballots by Jan. 14 – always two weeks before the election – by coming into the office or by letter. The town sends the Hancock voter the paperwork; they fill it out and send it back. A lot of people are actually bringing their paperwork into the office,” Finney told A Miner Detail. “Once an absentee ballot is completed and is received by the town, it’s placed into an envelope with the rest of the ballots and tucked away into a safe at town hall. The safe is opened on election night and the absentee ballots are counted,” Finney continued. Finney told A Miner Detail that in addition to Town Manager Dave Smith being involved with the ballot counting process, election supervisors and election judges are involved in overseeing the counting of ballots. Emergency ballots are granted to town residents in the event of a discernable emergency, Finney said. Dardar did not respond to a request for comment for this story. Incumbent council members Tim Smith and Levi Little are seeking re-election. Other council candidates include David Kerns, Preston Hall and Roland Lanehart Jr.
Town residents can vote at Town Hall on Monday at 126 W. High Street. Polls are open from 11 a.m. to 7 p.m. The results of the election will be announced once all ballots have been counted.